I was looking forward to the Tusker House cinnamon rolls...but they've changed them. They used to be really thick, but now they are a lot thinner (though they are bigger around)...they just aren't nearly as good. The rest of the breakfast menu has changed, too - Lee used to get the sausage biscuit but that's gone...instead they serve a scrambled egg and breakfast meat (ham, bacon, or sausage) and potatoes plate. It was quite a bit of food, though, and Lee said it was ok. The line for the safari was a WHOLE lot longer by then, but we breezed through with our Fastpasses. And got our usual set of dirty looks. :-) When are people going to figure out that Fastpass is FREE and *anyone* can use it? For once I didn't mind the lame poacher story quite so much, but I noticed that Jonathan (and the driver we'd had two days before) had both turned the radio down so that we *didn't* get so much of the chatter from "Warden Matua", which is generally more distracting than informative. After the safari we walked through Pangani Forest. Down at the savannah overlook we talked to CM Keith for a while - he answered several questions for us, though we stumped him when we asked how much a meerkat weighs. 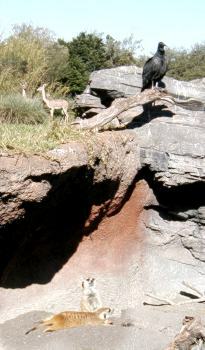 :-) (These meerkats certainly don't seem to be at all concerned that there's a vulture perched right over their heads!) Keith used to be a Safari driver, but said he asked to be moved after a while because he didn't get enough guest interaction on the Safari. We told him our frustrations with the stupid poacher story and he sympathized and said that he's heard the same thing from a lot of guests as well as from the Safari drivers. Maybe one of these days Disney will actually do something about it...we can always hope. *** Did you know that meerkats weigh about 2 pounds? 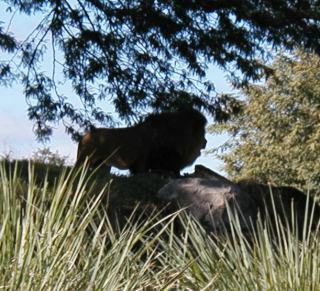 Keith also told us a lot about the gorillas - there are 4 bachelor males and six in the family troop. In addition to the male silverback and two adult females there are a 9 year old male and a 4 and 5 year old (females, I think). One of the bachelors is 22 years old and gets picked on a bit by the others. When we got over to the gorillas one of the bachelor males had a blanket that he was playing with...he waved it several times like he was going to spread it out on the ground, and then he took it down under some bushes and was doing the same thing...I guess he eventually got it spread out to his liking, but we couldn't really see him then. In our typical oh-so-efficient park-touring fashion (not) we went over to Dinoland to get a Fastpass for Primeval Whirl - but they weren't distributing them, so we went back to Asia to see Flights of Wonder. There was nothing new in the show, but we did get to sit in the first row, and that was new for us! We still enjoy seeing the birds' behaviors...and for some reason the "Guano Joe" story and jokes don't wear thin and are still funny. The guy who plays Guano Joe certainly has a lot of staying power - he's been there for at least three years. *** Did you know that the Eurasian Eagle Owl is believed to be the largest species of owl? 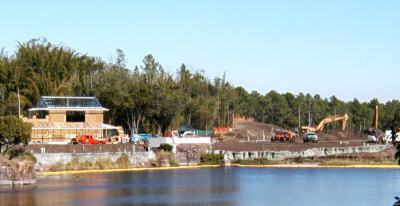 One thing that was very surprising to us is that the excavation for the new Expedition Everest attraction is *very* visible from the Dinoland area...Disney has not made any attempt to put up walls or barricades with the usual "Pardon our dust" sorts of messages to hide the construction area. We had lunch at Pizzafari - that's the first time we've eaten there in quite a while. Not because we don't like it, but because we usually prefer Tusker House. My Italian deli sandwich was quite tasty, and Lee said the chicken Caesar salad was good. 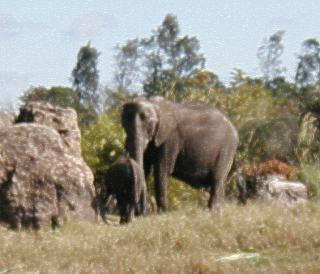 We hadn't visited any of the animals on Discovery Island yet...though on the back side the capybaras were the only ones out. But they were actually both standing in the water - something we hadn't seen before. Of course they were *standing* in the water while they were *drinking* it...ewwww. 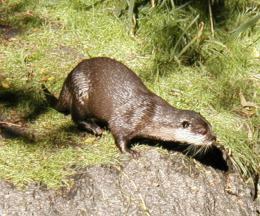 We also saw the Asian small-clawed otter - that's the first time we've seen an otter in our last three or four trips. He was very cooperative - he was swimming in the water and romping around all over his enclosure - he seemed to be trying to make sure that everyone had a chance to see him. Otters are so cute...and they always look like they are having so much fun! It was time to relax after our exhausting morning :-), so we went back the room for a while...I worked on this trip report while Lee napped. 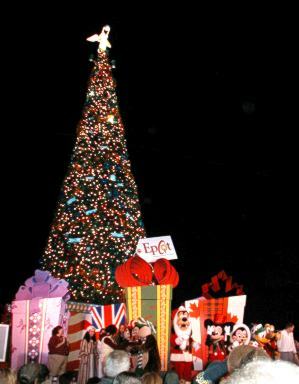 At about 4:15 we walked over to Epcot to the America Gardens theater, where we had priority seating for the 5:00 Candlelight Processional. We got pretty good seats, in the second row of the section just outside the cover, but since the weather was clear we knew we wouldn't have to worry about rain like last year! *** Did you know that David Ogden Stiers was the voice of the Archdeacon in The Hunchback of Notre Dame? Our Candlelight Processional package included dinner at Le Cellier. Just like the last three years. Think we're in a rut? :-) As usual, we got there and they told us it would be a 15-20 minute wait. And that's about what it was. We had a nice dinner - Lee had the mushroom filet and I had the rosemary chicken. The idea of having chicken didn't really excite me (though it was good) but the salmon that I usually order came with strange things that didn't sound good at all, while the accompaniments to the chicken, cream cheese mashed potatoes and French green beans, sounded good - and they were. I had the salmon cakes for an appetizer - these had only been on the menu a couple of weeks according to our server. They were pretty good. Lee had his usual - the cheddar cheese soup. For dessert we both had the maple creme brulee. Our server was efficient and there wasn't a lot of time between courses but we didn't feel rushed at all. We were out of there in about an hour. With as busy as that restaurant is it's nice to see that they are moving people through a little more quickly, since we have had some very leisurely meals there in the past. Mileage for the day: (My pedometer was NOT counting properly - we did a lot of walking around Animal Kingdom and Epcot!) 3.15 miles, 7409 steps. Woo hoo! of the day - Our Safari with Jonathan. Disappointment of the day - the new-but-definitely-not-improved cinnamon rolls at Tusker House. Pet peeve of the day - the lame poacher story on the Safari. Text and photographs copyright © 2003, 2004 by Laura Gilbreath. All rights reserved.